This is substantially what is now on the stone, the differences possibly because Dugdale was only precise with heraldry. Most scholars agree that this represents a fear of consignment to the charnel-house. If these were the last lines that Shakespeare wrote the fact that he was on his deathbed could explain their poetic inferiority. Another explanation is that the inscription is not by Shakespeare and he may not have known anything about it. A late-seventeenth-century note in a copy of the Third Folio (1664) maintains that the inscription was ‘ordered to be cutt by Mr Shackspeare’ (1693). While the identification of the inscribed stone as marking Shakespeare’s grave is very early (possibly within a year of his death), the information that he ordered it to be cut on his stone dates to 1664 at the earliest, reinforced after 1669, and the tradition that he wrote it himself dates to c.1655/6: the verses are not ascribed to Shakespeare until forty years after his death. 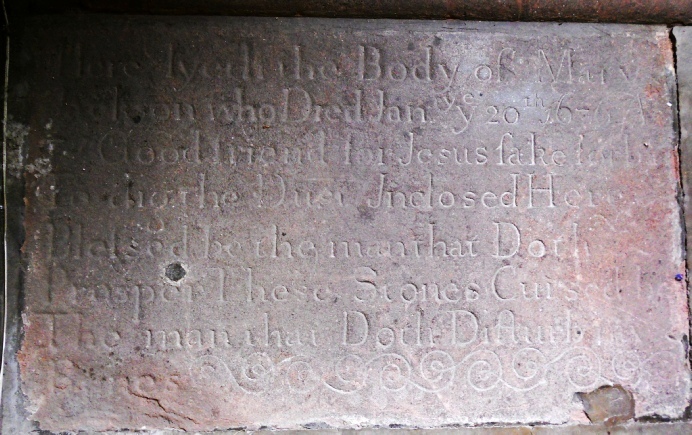 As the gravestone was either repaired or replaced in the mid-eighteenth century the discrepancies in the transcriptions may be due to difficulties in reading a worn stone, and Dowdall and Roberts may agree with Dugdale because they used to Dugdale to help them decipher the inscription. But damned be he who moues this cruste! Chambers says that he ‘cannot identify’ Halliwell-Phillipps’s manuscript source, and seems wary about its authenticity. If Chambers could not find it, then it is unlikely (though not impossible) that later scholars will be able to do so, and the spelling as recorded looks rather ersatz ‘olde’. However Halliwell-Phillips, although questionable in his dealings in books and manuscripts, has not been convicted of being unscrupulous in reporting their contents, so it is feasible that the manuscript does – or did – exist. Certainly there is at least one other version of Shakespeare’s grave inscription. The material appears to be the local ironstone, the lettering only moderately accomplished, the setting-out deplorable. The stone is aligned north/south, suggesting that it has been moved from its original location, and set in a repaved floor, perhaps when the south aisle was rebuilt in 1863. It may simply be derivative of the inscription on Shakespeare’s gravestone, as published by Dugdale, and a reflection of Shakespeare’s growing fame. In this case, why was Shakespeare’s verse as found in Dugdale rewritten (to its detriment)? 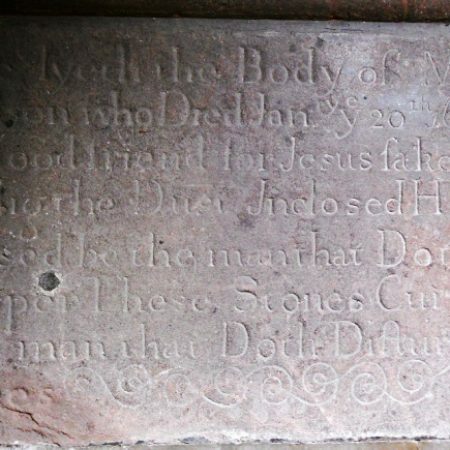 Allesley is 17 miles from Stratford; possibly both this and Shakespeare’s stone are examples of a mortuary verse in use in the seventeenth century – there may be more examples in the area. This does not preclude Shakespeare’s being the original author, although it does make it more unlikely. Formulaic inscriptions are most usually found on the grave-markers of the middling sort: there seems to be no record of a Jackson family as land-holders in Allesley at any period and the stone does not suggest that its commissioner was more than modestly prosperous. 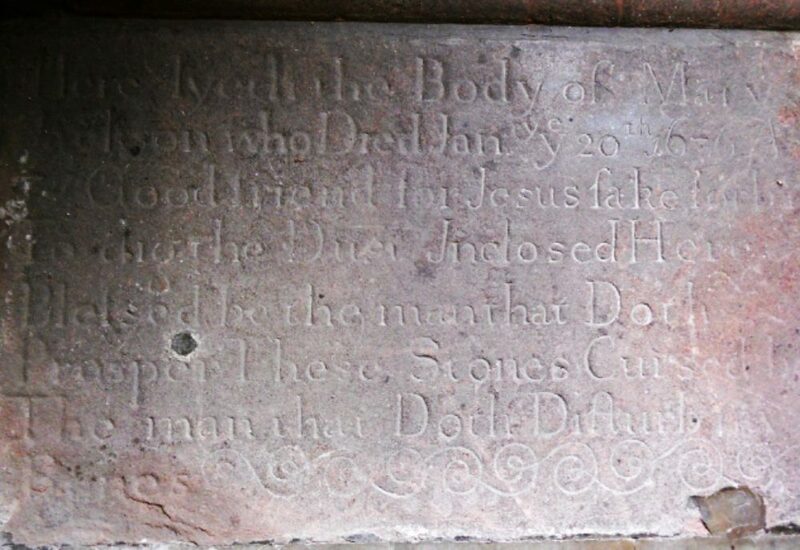 Another grave-inscription which uses at least some of the words found on Shakespeare’s is at High Ercall (Shropshire) to John Hotchkiss, vicar, 1689 and there are others from Shropshire (1797), and Manaccan (Cornwall) (1766). The first claim that Shakespeare wrote and ordered the words to be carved on his gravestone post-dates 1655. They were first published in 1656. While the eighteenth-century reuses may derive from Dugdale, the seventeenth-century variants, particularly the 1630s one – if it existed – suggest that what is carved on Shakespeare’s grave is a formula of the ‘As I am now so shall you be’ type, and not by Shakespeare at all. This would explain the variations in the early reports of its wording – what was written down was a formula that the recorders already knew and they supplied the illegible bits of the inscription from their own knowledge of it. Allesley is the earliest comparator after Dugdale and gives weight to the formula argument. Shakespeare’s gravestone is modest. It is not a fine heraldic ledger like those of his grandson-in-law, Thomas Nash, son-in-law, John Hall, and daughter Susanna, which adjoin his slab in a row to its right (facing east). Halliwell-Phillips is the source of the statement that Shakespeare’s slab had sunk, and was replaced – this is usually taken to mean that it was substituted, but it might have simply been put back where it should be and that what we see is the original inscription – it is certainly more plausible as an early seventeenth-century inscription than a mid-eighteenth-century one. It is possible that no more was done by Shakespeare’s heirs because of the state of the chancel (ruinous in 1618). If it was anticipated that the floor would be replaced, why waste money on an expensive ledger? By 1623 when Anne Hathaway was buried – and by when Shakespeare’s wall-monument had been erected – the chancel had been repaired. This would explain the posh armorial ledgers enjoyed by his descendants. It might also explain the use of a conventional warning against disturbing the body: if it was anticipated that there was going to be a lot of fossicking about in the floor of the chancel in the near future Shakespeare’s heirs may well have wished that his corpse remain undisturbed. A recent televised archaeological survey has suggested that Shakespeare’s grave was disturbed, and that this might have been due to grave-robbing. The disturbance could equally well have been the eighteenth-century repair mentioned by Halliwell-Phillips. Apart from this the programme’s ‘revelations’ contained nothing to surprise scholars of Early Modern burial practice: he was buried in a comparatively shallow grave, possibly brick-lined, not in a vault, and in a woollen (as was required by law) not in a coffin. 1. Shakespeare died on April 23, 1616 (MI) and was buried in the Parish Church on 25 April (Church Burial Register), in the chancel (he was one of the lay-rectors) on the north side (location of the monument and of family graves). At this stage the chancel was ruinous and walled off from the church. 2. In probably the mid-1620s, but possibly as early as 1617/8, John Weever recorded the inscriptions on both the wall-monument and the grave-slab, but did not say they were by Shakespeare, or that he ordered them. They might not have been taken down on the spot, but transmitted by a third party: the transcription implies that only the last two lines are on the slab, see 9 below. 3. The chancel was repaired 1621-2. 4. Anne Hathaway was buried on 6 August 1623 on the north side of the chancel, in the space between Shakespeare’s stone and the wall. This (assuming that the interments faced east) would put her on her husband’s left, the correct position. The monument to Shakespeare was almost certainly in place in 1623 (It is mentioned by Leonard Digges in his commendatory verse to the First Folio). 5.1634 Lieutenant Hammond visits Stratford: he remarks Shakespeare’s monument, but not the floor-slab. 6. 1635 John Hall (Shakespeare’s son-in-law) dies: his ledger-stone is in the chancel next-but-one south to Shakespeare. 7. 1647 Thomas Nash (Shakespeare’s grandson-in-law) dies: his ledger-stone is in the chancel next south to Shakespeare, possibly in the place left vacant for Susanna Shakespeare Hall, who would thus have been between her father and her husband, and on the latter’s left. 8. 1649 Susanna Shakespeare Hall dies: her ledger-stone is in the chancel next to John Hall. 9. In Francis Fane’s earlier Commonplace Book (1619-1672+) he records the last two lines of the inscription as “Shax Epitaf”: this might have been based on Weever, or on a joint source. 10. Post-1649 Dugdale visits the church (?again): he records both inscriptions but does not attribute them to Shakespeare. 11. In a Commonplace Book compiled ca.1655/6 for his son Henry, but with the last entry 1663 (Folger Library) Fane includes the grave-verse again, this time ascribing it to Shakespeare. This also occurs in a similar Commonplace book compiled for his son Francis. 12. 1676 The ledger to Mary Jackson at Allesley. 13. At some point after 1673 Robert Dobyns claims that in 1673 he transcribed the epitaphs to Shakespeare and John Coombe, and that the Coombe epitaph (satirical and widely ascribed to Shakespeare) has been razed by the time of writing. This cannot be true, he can only have transcribed the Coombe ‘epitaph’ from a paper attached to the grave, and even this seems unlikely. So he is unreliable. 14. 1693. Mr Dowdall, describes the epitaph on a plain free stone, saying it was made by Shakespeare ‘a little before his death. His informant was the then parish Clarke ‘aboue 80 yrs old’, who also said that grave remained inviolate because of curse, although his wife and daughters wanted to be buried with him. (The clerk was probably William Castle, born 1614). Dowdall also includes the claim that Shakespeare was a butcher’s boy who ran away and joined the stage. Anne Hathaway Shakespeare and Susanna Shakespeare Hall ARE buried with Shakespeare, although not (judging by the ledgers, and confirmed by recent the archaeological survey) in the same grave. Judith Shakespeare Quiney (1583-1662) was not buried with her parents, but in the churchyard. The interments in the chancel represent the line of descent of Shakespeare’s fortune, not his genetic line. 15. 1694 William Hall reports the ledger inscription & the tradition that Shakespeare ordered it to be inscribed. He accepts Shakespeare’s authorship & tries to explain the bad versification by the fact that Shakespeare was addressing ‘clerks and sextons, for the most part a very ignorant sort of people.’ He says Shakespeare was buried 17 feet deep (this has been recently disproved by a GPR survey). This is almost certainly too late for any first-hand memory of the burial, and sounds like a local tradition, perhaps again transmitted by William Castle. 2. The epitaph is not by Shakespeare but circulated as above and was chosen by him. Allesley in both these cases provides evidence of Shakespeare’s early posthumous fame. 3. The epitaph, whether chosen by Shakespeare or not, is commonplace and widespread around the country. In this case biographical speculations based on it collapse. 4. The epitaph has nothing to do with Shakespeare, but marks another person’s grave, and was in place at the time of his interment, somewhere else in the chancel. It has been assumed to be Shakespeare’s because of its proximity both to his wall-monument and to the named graves of his widow and descendants. – If anyone has any other examples of the use of this verse, I would be most interested to learn about them. I am grateful to Jon Bayliss for his help with this. If anyone would like a fuller, sourced, version, e-mail me at jlw29@cam.ac.uk. Gaps at the ends of lines are filled in with scrolled decoration.